Cyanotic Congenital Heart Disease (cCHD) is characterized by intracardiac right-to-left shunting of unsaturated blood and its distribution into the systemic circulation resulting in arterial hypoxemia. Patients with cCHD develop repeated brain abscesses secondary to polycythemia-induced cerebral infarcts; further, poor host immunity and bypass of lung phagocytosis are contributory factors. cCHD, especially Tetrology of Fallot (TOF), accounts for nearly 13-70% of all brain abscess cases. , Management of a usual brain abscess includes either aspiration by various techniques and 6-8 weeks of antibiotics or craniotomy and excision in abscesses unresponsive to antibiotics, in large and superficial abscesses in non-eloquent brain regions causing significant mass effect and neurological deficits, and in multi-loculated abscesses. , In patients with cCHD, however, the choice of surgery is also influenced, to a large extent, by their preoperative state and ability to handle general anesthesia (GA). 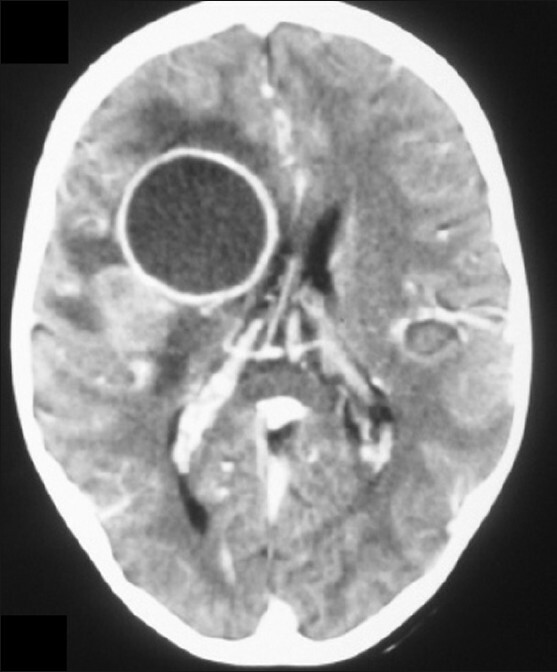 Presence of a fragile cardiopulmonary status and various systemic and coagulation complications, together with abscess-induced problems such as raised intracranial pressure (ICP), seizures, dehydration, electrolyte imbalance, and meningitis make cCHD patients high-risk candidates for abscess excision under GA. Hence, in these patients, treatment of an abscess is often limited to aspiration under local anesthesia (LA); further, repeated aspirations are continued even when excision is clearly indicated. , However, GA with controlled ventilation benefits small, uncooperative children and those with a high ICP, seizures, congestive cardiac failure (CCF), hemodynamic instability, and history of frequent cyanotic spells; it is thus imperative to be familiar with the anesthesia practices in patients with cCHD. While sufficient literature exists discussing the neurosurgical aspects of brain abscesses in cCHD patients, none addresses the anesthetic issues. ,,, We present here our experience in anesthetising children with cCHD for brain abscess surgery and discuss the relevant medical literature. Between January 2005 and December 2009, several patients with cCHD were managed surgically for brain abscesses at our institute, but only four children received GA; [Table 1] and [Table 2] present their preoperative data. Emergency surgery was undertaken with a high-risk consent. Fever, coagulopathy, dehydration, electrolyte imbalance, and metabolic acidosis were corrected prior to surgery, where possible. Preparations before anesthesia included readying inotropes/vasopressors, administering prophylactic antibiotics, and de-airing of all intravenous (IV) lines. Intravenous fentanyl (2-4 μg/kg), midazolam (0.5-1 mg), atracurium (0.5 mg/kg and 5 μg/kg/min infusion), and sevoflurane/isoflurane inhalation were used for anesthesia, and ventilation was controlled. Besides routine monitors, invasive arterial blood pressure (ABP), central venous pressure (CVP), and arterial blood gases were monitored. Isotonic fluid therapy was CVP-guided; Fresh Frozen Plasma (FFP) and platelets were transfused as indicated. Postoperatively, the children were intensively monitored for 4-5 days [Figure 1]. Cases 1, 2, and 4 were hemodynamically stable and without major complications during surgery. Metabolic acidosis was corrected in all children and hyponatremia in Case 1; FFP was transfused in Cases 1 and 2. Case 1 suffered repeated postoperative cyanotic spells with exaggerated cyanosis, decrease in oxygen saturation (SpO 2 ) to 41%, decrease in ABP to 58/33 mm Hg, and increase in Heart Rate (HR) to 162 beats/ min; he was treated with 100% O 2 , IV boluses of morphine (1.5 mg) and propranolol (2.5 mg), soda bicarbonate, and rapid fluids. The spells stopped after regular propranolol therapy was started. Case 2 had repeated postoperative seizures and had to be re-ventilated for 48 hours; his seizures persisted, though less frequently. All three patients had gradual neurological recovery and were subsequently transferred to cardiology. For Case 3, dopamine infusion (7 μg/kg) was started before inducing anesthesia; during surgery, she had stable ABP and SpO 2 , but persistent tachycardia (HR 170-180 beats/min). Paracetamol, FFP, and soda bicarbonate were repeated. She was ventilated postoperatively and dopamine was replaced with noradrenaline infusion (0.025 μg/kg/min). Following extubation after 2 days, she was hemodynamically stable; however, the child developed septicemia and died after 34 days. Blood loss in all four children was within acceptable limits, and none received blood transfusion. Anesthetizing children with cCHD and a brain abscess is a major challenge necessitating the use of an anesthesia regimen appropriate to both cCHD and intracranial surgery. A higher risk of perioperative complications and cardiac arrest, and 30-day mortality is reported in children with Congenital Heart Disease (CHD), especially cCHD, undergoing non-cardiac surgery as compared to the normal population. Patients below 2 years of age, those undergoing emergency surgery, and those having severe cyanosis, poorly compensated CCF, and major cardiac anomalies are particularly at risk. A significantly higher mortality has also been reported in cCHD patients during brain abscess aspirations, attributed variously to cyanotic spells  and to a greater midline shift and cerebral edema;  moreover, surgery under LA is likely to exaggerate both these conditions due to the accompanying anxiety, pain, and excessive crying. A carefully administered GA with controlled ventilation, advanced monitoring, and better preparedness for handling emergencies facilitates a safer environment for maintenance of hemodynamics, oxygenation, and ICP and seizure control, as is highlighted by the safe anesthetic outcome of our patients. With more experience, the perioperative complication rate in patients with cCHD undergoing brain abscess surgery is likely to decline further. 1. Ghafoor T, Amin MU. Multiple brain abscesses in a child with congenital cyanotic heart disease. J Pak Med Assoc 2006;56:603-5. 2. Prusty GK. Brain abscesses in cyanotic heart disease. Indian J Pediatr 1993;60:43-51. 3. Sharma BS, Gupta SK, Khosla VK. Current concepts in the management of pyogenic brain abscess. Neurol India 2000;48:105-11. 4. Moorthy RK, Rajshekhar V. Management of brain abscess: an overview. Neurosurg Focus 2008;24:E3. 5. Takeshita M, Kagawa M, Yato S, Izawa M, Onda H, Takakura K, et al. Current treatment of brain abscess in patients with congenital cyanotic heart disease. Neurosurgery 1997;41:1270-9. 6. Atiq M, Ahmed US, Allana SS, Chishti NK. Clinical features and outcome of cerebral abscess in congenital heart disease. J Ayub Med Coll Abbottabad 2006;18:21-4. 7. Yumul R, Emdadi A, Nassim M. Anesthesia for non cardiac surgery in children with congenital heart disease. 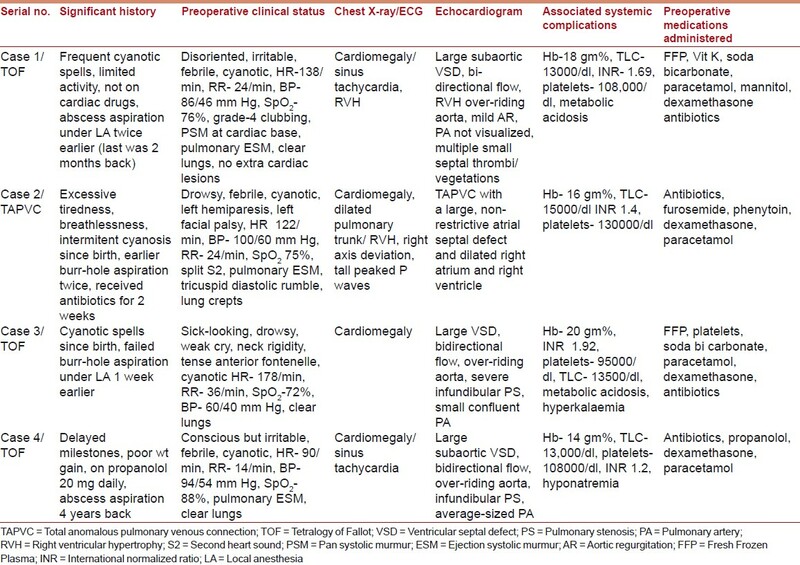 Semin Cardiothorac Vasc Anesth 2003;7:153-65. 8. White MC. Anaesthetic implications of congenital heart disease for children undergoing non-cardiac surgery. Anaesth Intensive Care Med 2009;10:504-9. 9. Flick RP, Sprung J, Harrison TE, Gleich SJ, Schroeder DR, Hanson AC, et al. Perioperative cardiac arrests in children between 1988 and 2005 at a tertiary referral center: A study of 92 881 patients. Anesthesiology 2007;106:226-37. 10. Baum VC, Barton DM, Gutgesell HP. Influence of congenital heart disease on mortality after noncardiac surgery in hospitalized children. Pediatrics 2000;105:332-5.